Sometimes as a parent you don’t get to enjoy the finer things in life, yeah I know that was a stretch, but if you have picky kids you have to eat the same boring stuff all the time. Today I was in the mood for ham and swiss, but with a twist. I could taste tomato and onions, and as soon as I added the tomatoes to the inner of the pinwheel, I thought to myself, “Self, the perfect topping for this is that Sun‑Dried Tomato & Basil Seasoned Parmesan right above your head in the cabinet” and voila I had a masterpiece. 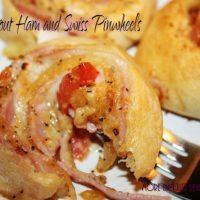 These Ham and Swiss Pinwheels were like something out of an expensive restaurant only it wasn’t expensive, and it tasted like heaven. You could add almost anything and make them your very own masterpiece. If you plan on trying this recipe, make sure you Pin it or add to your Yum Cookbook by using the buttons above. Thinly slice tomato and onion, set aside. Lay onto your dough, ham, swiss cheese, tomato and onion. 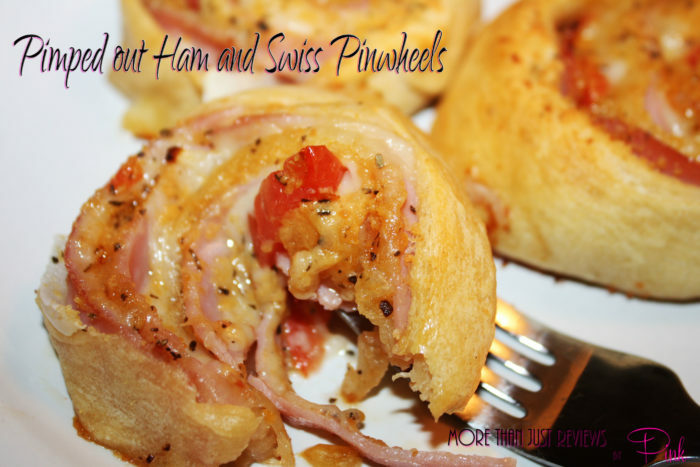 Roll tightly and then slice into 6 pinwheels. Top evenly with Kraft Sun‑Dried Tomato & Basil Seasoned Parmesan. Bake for 15 to 17 minutes till crescent is golden brown. Serve with honey mustard or your favorite dressing.